Everything’s a bit slower in Savannah, Georgia. The coastal city hugs South Carolina at the Savannah River (it’s just 45 minutes from Hilton Head), and exudes a bit of Charleston charm and New Orleans flair. It’s known for its stark southern architecture (40 percent of the city’s 2,500 buildings have architectural or historical significance) and open container law, perfect for long ambling strolls through the city’s 24 squares draped in low-hanging Spanish moss. The magic begins right when you touch down and emerge from the terminal to the airport’s faux town square complete with skylights, a piano player, and shoe shiner. Here’s your definitive long-weekend travel guide to Savannah, including where to stay, what to eat, where to go, and more. Go on a ghost tour in Savannah and you’ll learn it’s nearly impossible to find a hotel that isn’t haunted. 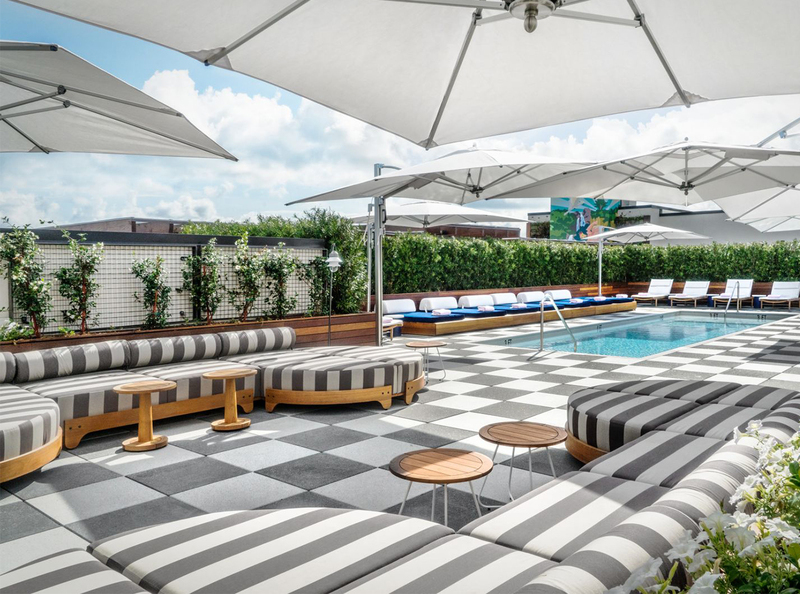 One that fits the bill nicely: the newly opened Perry Lane, complete with a rooftop pool, bar, and hangout lounge called Peregrin (it’s a good spot to watch the fireworks that take place on the first Friday of every month). Conveniently situated in the historic district, the hotel has bikes and books for guests to check out during their stay. Plus, there’s a solid basement gym that boasts Peloton bikes, treadmills, and weight racks, and the hotel hosts rooftop yoga classes on Tuesday nights and Saturday mornings. There’s still some ghost-like charm, too: The hotel’s muse and grande dame is Savannahian, Adelaide Harcourt—all of the artwork (and there’s quite a collection of it) and decor pays homage to her. But guess what? She’s fictional. If you don’t mind being a little bit removed, try The Westin Savannah Harbor Golf Resort & Spa. It’s across the Savannah River, but the Westin runs a boat shuttle to River Street, a strip of century-old buildings (some of which were once cotton warehouses) that are now antique shops, restaurants, hotels, and souvenir shops. The resort also houses the Savannah area’s only PGA championship golf course, serenely set between the banks of the Savannah and Back rivers (read: a beautiful lowcountry setting, assuming you have bug spray). Ghost hunters will feel right at home at Kehoe House, a downtown inn with a spooky past: As the story goes, The Kehoe family had 10 children—two are said to have died in the home (which was also once a funeral home). Substantiated or not, guests report running into ghost children at the inn. The bed and breakfast is beautifully situated in a restored 1892 mansion at Columbia Square. Savannah’s famed restaurant is talked about for good reason: It’s perfected Southern cuisine (think: bourbon-molasses grilled pork tenderloin with sweet potato fries and collards). Make a reservation or stumble across the restaurant on the earlier side by way of its side entrance on E. Saint Julian Streets, where there’s outdoor seating. With locations now in Nashville, Charleston, and Greenville, Husk always promises locally sourced ingredients (right down to the cane syrup used in your food). The Savannah location is set in an old, three-story mansion where you can enjoy lowcountry cooking. This homemade ice cream will likely be some of the best you’ve ever had—even if you go for a classic flavor, like chocolate. This always-packed Australian-style outdoor-indoor cafe is situated on a quiet city block. Come for brunch, dinner, or coffee to-go. Take the steps down to River Street for a walk through Savannah’s Candy Kitchen: It’s 4,200 square feet of bliss, and just so happens to be the Southeast’s largest candy company. Nab a free praline sample. Perry Lane’s eatery is ideal for grabbing an espresso or a gourmet sandwich to-go, or sitting down for local Flounder en Papillote and wine. Next door to Perry Lane, this pizza point whips up impressive, organic Neopolitan-style pies. Sure, you could walk around Savannah and take iPhone photos of the buildings you see (wondering why they look the way they do). Or you could have Jonathan Stalcup, a SCAD grad with a masters in architecture, tour you around, explaining the differences between styles of architecture present in the city from the Regency Period to Gothic Revival. It’s a #MansardMonday #Palladian style! The #BasilicaPalladiana in #VicenzaItaly from 1546. Uber about 20 minutes from downtown and you’ll arrive in the small waterfront community of Tybee Island. Packed with miles of beaches (and beach bars to complement said beaches) plus bike paths (and rental shops), boating opportunities, and water sports adventures, it’s a must for those who crave the ocean. See Forsythe Park before everyone wakes up by biking up Bull Street, under the Spanish moss, early in the morning. At the park, stop for a sandwich from the deli at natural food store Brighter Day or breakfast at The Sentient Bean, which uses old school trophies as numbers for your food while you wait. On your way back, stop at antique stores that dot the path. At The Club at Savannah Harbor, you’re right across the river from downtown (this is the Westin’s course), but you’ll feel world’s away. Savannah Quarters Country Club, where you can tee off under tall cypress and oak trees, is only 20 minutes away, too. Learn about moonshine making and bootleg operations of the past or take a cocktail-making class at The American Prohibition Museum. Walk through City Market, full of bustling bistros, artists markets, galleries, and shops (with a drink in tow) after.